Malvern, PA, USA – September 20, 2017 – The Micro-Measurements® brand of Vishay Precision Group, Inc. (NYSE: VPG) (www.micro-measurements.com), industry experts in the design, development, and manufacture of resistive-foil sensors for high-precision strain measurements, has introduced a new range of miniature, lightweight hybrid sensors, offering cost-effective force, displacement, pressure, strain and acceleration measurements within high-volume OEM and test applications. Design of the new Micro-Measurements hybrid sensor range incorporates the brand’s own renowned precision foil strain gages, adhesively bonded to flat substrates, constructed of either metal, composite, or polymer. Hybrid sensors are manufactured by VPG using the same high-volume production equipment as those used to create its precision strain gages. The result is a cost-effective family of strain-gage based hybrid sensors with consistent batch-to-batch performance characteristics. Customers may further incorporate an optional miniature signal amplifier, as either a stand-alone component or attached to the sensor. Hybrid sensors may be attached via mounting holes with choice of screws, spot welding, or clamping, thereby eliminating adhesive bonding requirements. The hybrid sensors are further optionally available with pre-attached lead wires and connectors, for simplified customer handling without soldering requirements. New hybrid sensors can effectively support a variety of high-volume OEM consumer product, process control, automotive testing, non-critical medical device, educational research, and industrial requirements. Typical consumer product applications include appliances, sporting equipment, hand tools, and lawn and garden equipment. Process control applications include HVAC, liquid-level sensing, motor control, and vibration monitoring. Automotive testing applications include passenger weighing, foot-pedal pressure, seatbelt tension, emergency braking, suspension control, and engine monitoring. Medical applications include pumps, respirators, and other non-critical devices. Industrial applications include elevators, tank monitoring, bearing insertion, safety systems, gas and liquid cylinder pressures, and load monitoring. 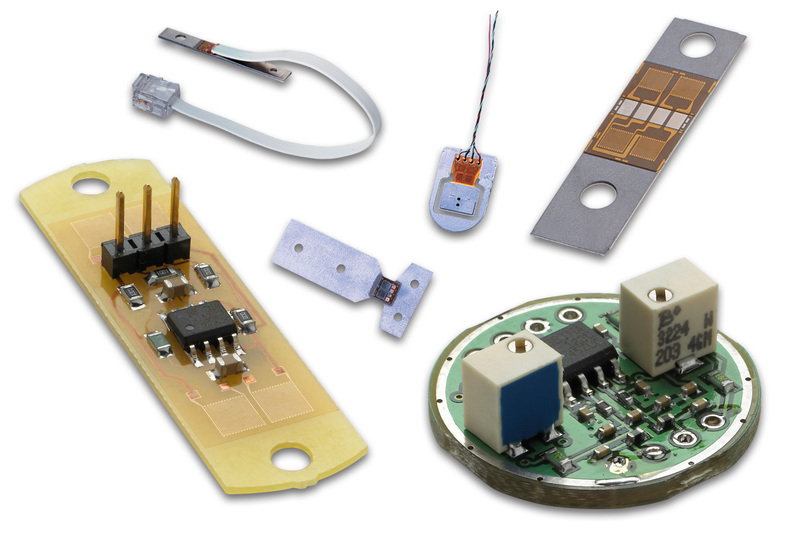 For more information regarding hybrid sensors, or other products offered by Micro-Measurements, visit www.micro-measurements.com. Vishay Precision Group, Inc. is an internationally recognized designer, manufacturer and marketer of: components based on its resistive foil technology; sensors; and sensor-based systems specializing in the growing markets of stress, force, weight, pressure, and current measurements. VPG is a market leader of foil technology products, providing ongoing technology innovations in precision foil resistors and foil strain gages, which are the foundation of the company’s force sensors products and its weighing and control systems. The product portfolio consists of a variety of well-established brand names recognized for precision and quality in the marketplace. To learn more, visit VPG at www.vpgsensors.com. Micro-Measurements, a Vishay Precision Group, Inc. (VPG) brand, is dedicated to the development, manufacture, and marketing of resistive-foil sensors for high-precision strain measurement. Micro-Measurements offers a full complement of strain gages, PhotoStress® equipment and coatings, data acquisition systems, and supplies necessary to obtain accurate, reliable stress data. Our products are used throughout the industrialized world — both in the practice of stress measurements analysis and as the sensing elements in a wide variety of transducers for measuring physical variables (weight, force, torque, pressure, etc.). More information about Micro-Measurements is available at www.micro-measurements.com. Micro-Measurements and PhotoStress are registered trademarks of VPG. We welcome your quality content in this category and will make our best effort to publish your post. Please email your content to us here. You can also post your content or ask questions about robot related subjects at anytime, for free, by registering and posting at our forums.